A contract is a legally recognized agreement made between two or more people. The agreement details each party’s obligations and can be enforced in court. Client comes to you wanting to “get out of” a consumer contract or a credit agreement. Client asks if they can get compensation for a consumer contract that the client says was unfair. Client is being sued on a consumer sale contract or a credit contract and wants to know what a court might decide about it. Under common law, the following fundamental elements must be present before the courts will enforce an agreement. Contracts are enforceable promises, but not all promises are enforceable. For enforceability, there must be an intention to be bound by the promise. This intention can be found in what a person says or does, and in the circumstances under which the promise is made. Each party to the contract must have capacity — the legally recognized ability, intelligence, and maturity to appreciate the significance of what an adult would understand as being a legally enforceable promise. One area where the qualification of capacity is especially important is for contracts concerning people under the age of 19. These are known as “infants’ contracts”. There must be an offer to contract on certain terms, and an acceptance of the offer on those terms. A response to an offer that makes any material change in the terms or conditions of the content of the offer is not an acceptance; it is a counteroffer. The parties must agree on the essential terms to make the contract binding. If there is no agreement, or if one or both of the parties misunderstands an essential term, there may be no contract. An agreement that leaves one of the essential terms to be decided at a future time is usually unenforceable. Terms can be express (that is, specifically stated or written, or both, by the parties) or implied (that is, not specifically stated or written, but reasonably taken from the actions or understanding of the parties to the agreement, or from the law imposing the terms even where the parties did not specifically agree to the terms). Sometimes terms are implied in a contract by law. For example, where a contract is for the sale or lease of goods, the Sale of Goods Act implies a number of terms as part of the agreement. A promise must be supported by consideration before the law will enforce it. Basically, a promise is only enforceable if the person making the promise receives something of benefit from the person to whom the promise is made and who is seeking to enforce the promise. In most cases, this benefit is something of tangible economic value. However, it can also be an act or some other behaviour requested by the person who made the promise. A promise to give someone a car, if that person was giving nothing in return, would probably not be considered an enforceable promise; it would probably be considered a gift. However, a promise to pay someone else’s debt when that person is obtaining credit is usually considered an enforceable promise, which the law would probably consider a guarantee. Almost all consumer and credit contracts have the necessary intention, capacity, agreement, and consideration. While some aspects of modern consumer and credit contracts are governed directly or indirectly by statute law, most promises need only meet the basic requirements of common law to be enforceable. Some basic rights often given to consumers by statute law include the following. While the absence of a written document can make proof of an agreement more difficult, there is no general principle that all contracts must be in writing to be enforceable. Generally speaking, so long as all the elements of a contract are present, there is a valid contract. That said, some types of contracts must be in writing, under requirements in the statute law (for example, contracts involving real estate). These include the Law and Equity Act (see the sections on Mortgages and Foreclosure and the Recovery of Goods), the Business Practices and Consumer Protection Act, the Bills of Exchange Act (see the section on Contract Defences), and the Personal Property Security Act (see the section on Security Agreements). Where the statute law requires a written agreement, with certain terms specified in the agreement, a person seeking to enforce their rights may be able to get some compensation even if the requirements of the law were not met. Contracts that a consumer makes with one business, such as a merchant or a lender, are sometimes sold to other parties. For example, an appliance store may sell a consumer finance contract to a bank or finance company. The sale of the contract is called “assigning the contract”. In general, the party who buys the contract has all the rights to collect on it that the original party had. In the past, the party buying the contract wanted to limit the responsibility it had for any problems arising from the performance of the contract (for example, if the merchandise financed was defective). One way to do this was to have the consumer agree to a clause in the contract that they would not raise certain defences against the party who bought the contract (called the “assignee”). This was called a cut-off clause because it tried to cut off rights the consumer may have had before the contract was assigned. Consumers are now protected against cut-off clauses in certain types of consumer contracts. For contracts governed by the Business Practices and Consumer Protection Act, the law specifically says that consumers have the same rights against an assignee as against the original party who assigned the contract (called the “assignor”). The same protections apply for promissory notes (enforceable promises to repay a debt or loan) governed by the federal Bills of Exchange Act. A number of terms are implied in various consumer and credit contracts by statute. For example, certain warranties and conditions are implied in consumer sales of goods and leases under the Sale of Goods Act. A number of statutes say that the additional implied terms or protections given to consumers by that law cannot be given up by a consumer, even if there is a term in the agreement that says the consumer waives the right to have that protection. That is, the consumer is protected from contracting out of certain rights. These statutes include the Business Practices and Consumer Protection Act, the Interest Act and the Sale of Goods Act. In common law, a borrower did not always have prepayment rights — the right to pay off a debt obligation earlier than the date stated in the contract. If there were no terms that said the borrower could do so, the borrower was obliged to continue to make the payments of principal and interest called for in the agreement. For a discussion of where consumers now have a statutory right to prepay credit obligations, see the section on Prepayment Rights. Many consumer and credit contracts can be categorized by the types of terms or rights forming part of those contracts. In addition, there are various categories of terms that may arise in a wide range of consumer credit transactions. These contract categories, as well as the contract terms, arise both in common law and in statute law. Some of the more important categories and terms are listed here. Many are described in more detail under separate topics. Acceleration clauses are standard in most written credit contracts. The clause means that if a borrower misses making a payment on a credit contract, the creditor has the right to claim the whole remaining balance due from the borrower. The Business Practices and Consumer Protection Act defines a consumer transaction as supplying goods, services or real property to an individual for primarily personal, family or household use. The definition of “goods” includes personal property, fixtures and credit. “Services” include a membership in a club or organization. The Business Practices and Consumer Protection Act regulates these kinds of consumer transactions. 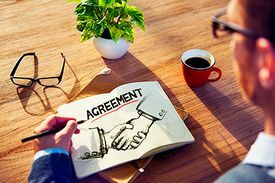 The words conditions and terms are often used interchangeably to refer to parts of a contract, but there is an important difference in their meaning. A condition is an essential term in a contract, a term that is so important that without it one or other of the parties would not enter into the contract. Sometimes the law (for example, the Sale of Goods Act) implies which terms are contract conditions. More likely, the contract is silent on categorizing terms in this manner. This distinction can be important when there is a breach of a contract. There are different remedies for breaches of contract conditions than for other types of contract terms (such as contract warranties, discussed below). This is explained in the section on Contract Remedies. The word warranty has at least two very different meanings in law. To consumers, it usually means a contractual promise that a seller makes about the quality of the goods or services sold. Under the law, a warranty is a broad label given to terms of a contract that are the non-essential terms of the contract. Sometimes the parties specifically define which terms are contract warranties, and sometimes the law (for example, the Sale of Goods Act) implies which terms are contract warranties. More likely, the contract is silent on categorizing terms in this manner. This broad categorization can be important when there is a breach of the contract, as there are different remedies for breaches of contract warranties, as distinguished from other types of contract terms (such as contract conditions, discussed above). This is explained in the section on Contract Remedies. Estimates are a difficult area of the law. The case law suggests that whether estimates are binding depends on the intention of the parties to the agreement. The interpretation of an estimate can be complicated when the estimate is not for a specific figure, but is given as a range or in descriptive terms such as “standard price”. For a case that considers the principles of law governing estimates, see ABCO Diesel Ltd. v. Dolphin Delivery Ltd. Note also that estimates are addressed in the Business Practices and Consumer Protection Act, section 4(3)(c)(iii). The Business Practices and Consumer Protection Act and the Consumer Contracts Regulation define a future performance contract as a contract for the supply of goods or services costing more than $50, where the delivery of the goods or performance of the services (by the supplier), or payment for either (by the consumer), is not made when the contract is signed. “Supply” is defined to include a sale, lease, assignment, etc. Future performance contracts do not include contracts for the supply of goods or services under a credit agreement if the goods or services have been supplied, and do not cover timeshare contracts. The Business Practices and Consumer Protection Act regulates future performance contracts. The word guarantee has at least two very different meanings in law. To consumers, it usually means a seller’s contractual promise about the quality of the goods or services sold. In law, there is a very different meaning, related to a type of credit contract. A contract of guarantee is a promise by a third party to honour a credit contract of a debtor if the debtor defaults on payment. The third party is called a “guarantor” and can be responsible for the debt if the debtor defaults. This type of guarantee is explained in the section on Co-signing, Guarantees and Joint Debts. The federal Bills of Exchange Act defines promissory notes as an unconditional promise made in writing by one person to another, agreeing to pay on demand, or at a fixed or determinable time, a certain sum to a specified person or to the bearer. Promissory notes are a basic form of credit contract. The Bills of Exchange Act regulates promissory notes and gives special protections to consumers who sign them. It requires that promissory notes given in consumer transactions be marked “consumer purchase”. This means that consumers cannot waive their contractual rights under the note if it is assigned to a third party. Under the Sale of Goods Act, the sale of goods is defined as between a buyer and a seller and includes all types of chattels (personal, moveable possessions). The Sale of Goods Act provides a number of rights and remedies in sale of goods transactions. In many standard form contracts, there are clauses in which consumers are asked to give up certain legal rights, particularly statutory rights, which may give them some protections if the contract is broken. As noted above, many consumer protection statutes have specific provisions that prohibit waiving of these rights. Even if a waiver clause is not specifically prohibited, consumers may still be able to obtain a remedy for breach of contract if a fundamental aspect of the contract is breached. This issue can arise, for example, in sale of goods transactions governed by the Sale of Goods Act. While consumers cannot waive their rights under that Act in the purchase of new goods, the rights can be waived in the purchase of used goods when those goods are purchased from retail businesses. The issue most often arises in the sale of used cars. Invariably, a car dealer’s sale contract has a waiver clause. The courts have said in a number of decisions that if the problem with the car is fundamental, the waiver of rights term in the contract will be interpreted very strictly against the seller. Often, the courts ignore the waiver clause and give the consumer a remedy. (See the section on Contract Remedies.) One of the leading cases applying this principle is Findlay v. Couldwell (for more on this case, see the section on Unfair or Deceptive Practices). Even if the fundamental elements for enforceability of a contract are present, a court may refuse to enforce the contract against one party. Historically, the common law has recognized a number of situations where defences are allowed (see the section on Contract Defences), and where the party seeking to enforce the agreement will not be given a remedy or will only be given a limited remedy. Such reasons are called defences. Many consumer and credit contracts are governed not only by the basic common law principles of contract, but also by many additional rules set out in statute law passed by the provincial and federal governments. See the section on Contract Defences. See the sections on Contract Defences and Contract Remedies for more context on what information to collect from the client. See the sections on Contract Defences and Contract Remedies for more context on solving the client’s problem. See also People’s Law School’s pages on contracts. This page was last edited on 11 October 2018, at 05:15.